Find a plan that suits you! Our training plans vary from Triathlon Training with the team, to personalized 1 on 1 private coaching for running, swimming, cycling or strength training, to ONLINE 1 on 1 training custom plans for each athlete! The team trains mostly in Key Biscayne, where we get together for transition bricks, long runs, and open water swims. Even our long rides start here! Online coaching can be anywhere around the world as we have athletes in Dubai, Ecuador, Colombia, etc. I began to get involved with sports as a young girl. I was part of a swimming team for eight years, played tennis for seven years and practiced speed skating for another three. I always competed and loved being on the podium, but as a kid, I never took it seriously. As I got older and more competitive, college introduced me to team Sports as I joined the Soccer team and joined the national team shortly after. I also started running 10 k's and marathons, and jumped into triathlon! After 10 years competing nationally and internationally, I moved to the US and started competing here and coaching. I immediately realized how rewarding it was to help people achieve their goals. As the team was founded in 2015, I started my IRONMAN University Coaching certification. I'm currently doing my Training Peaks Certification and USAT Coach Certification. 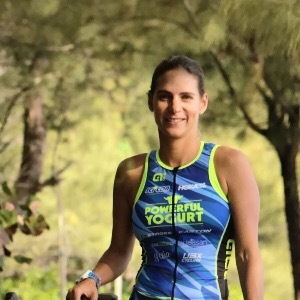 Participating in IRONMAN 70.3 World Championship four times has served not only as a motivation for myself, but also as a learning experience that I can share with my athletes. I hope to keep helping athletes, motivating newbies to the sport, or just helping others build a healthier lifestyle, while keeping myself active as a competitor and as a proud ambassador for all my current sponsor: Maurten, Rudy Project, Powerful Yogurt, Easton Cycling, Lululemon, 2XU, Alé Bikewear, SRAM, Scicon Bike bags, Stages Powermeters, Blueseventy, Cervelo among others. Success. Coach Vanessa Soulavy has been notified of your message.